The Longhorn Hotel and Casino is a funny little establishment located way out in east Las Vegas, across the street from Eastside Cannery. It is fit to serve the locals and nearby out-of-towners who want to get some gambling done in a low key environment. Nothing is impressive about this place – that’s not its goal. But it’s not an ugly dirty dump either. It’s clean enough, and if you want to get a taste of some of the funkier characters that reside in Las Vegas, then it’s worth an amusing visit. Regarding Longhorn’s sportsbook, they don’t take any action on horse racing. It is run by William Hill and mainly a place to drop-in, bet, and leave. We walked in at 7:30 PM, and the lone cashier was already closed. However, there is a kiosk right next to the cashier, so this at least made up for that. When betting at a William Hill location, be aware you need to have an account set up if you want to bet at least $1,000 for any pre-game wager, or $500 for any in-game wager, also known as live betting. Live betting isn’t offered for every single game, but it is available on the big games. You can place your live bets either at the sportsbook or using the William Hill sports betting app. The cashier and kiosk are in the corner of the casino right as you walk in. It’s next to a video poker bar. There’s no formal seating area for sports bettors, and the video poker bar has just four small TVs. The betting board consists of four other small TVs, but you can only read it if you’re sitting right near it. Being that this is just a tiny local joint, it’s never going to get too busy. However, since it’s a small bar, you could have a hard time getting a seat for a big game. The standard for drinking at sportsbooks is you have to bet a certain amount and then you get a drink ticket. 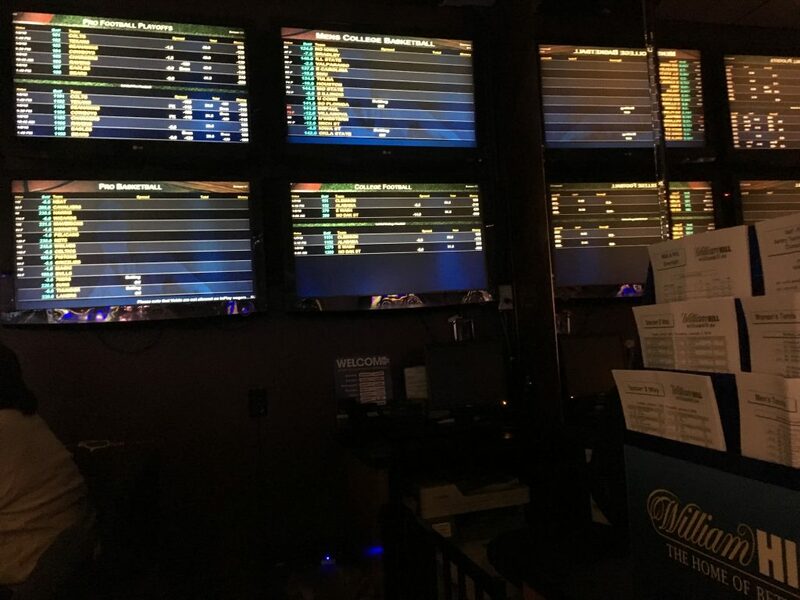 The minimums at off strip casinos are way less, but William Hill doesn’t give away any drink tickets as most of its bettors leave right after they bet. The small smoky casino is mainly just slot machines and a couple of $5 blackjack tables. There’s no craps, roulette, none of that. It’s kind of funny. Besides the video poker bar, the only way to drink is when a server comes by the slots or table games. There is no food court or anything, and the only restaurant is Chuckwagon. They serve American food and are open 24/7. The hotel has been remodeled and will be inexpensive, but don’t get too excited. This is just going to be a standard “off the highway” type room. However, Longhorn does distinguish itself by offering a Free Ace at a hand of blackjack along with a free $5 match play. At all William Hill sportsbooks, you receive one credit for every dollar you wager, and you need 5,000 credits to earn a $5 free play. The main reason to have an account is so your bet will be tracked. That way if you lose a winning ticket, you’re protected. It isn’t really fair to hold this sportsbook to any kind of actual standard. It’s a drop-in with basically no amenities. The only reason to watch a game at Longhorn is if you want cheap drinks in a quiet atmosphere.